Plenty of stores in America serve up premade sushi in plastic containers. They’re a quick, easy and usually not too expensive way to grab a meal. But if you’re not worried about keep things inexpensive, and happen to be in Japan, apparently you can throw down nearly $100 on a gold leaf-covered takeaway sushi roll – plastic container and all. This past Friday, in honor of Setsubun, a celebration of the day before the start of spring, the Japanese website RocketNews24 went out in search of a special type of sushi roll known as ehomaki. But not just any ehomaki: The site wanted the most expensive ehomaki they could find. In a discovery that will probably leave many Americans perplexed, a staff member found a gold leaf-wrapped Tokusen Kaisen Jyuni Hitoe Maki roll in the pre-packaged sushi section of Shinjuku Isetan, a Tokyo department store. The price tag: 10,800 yen… or about $97. Despite coming in your usual plastic sushi tray, however, this roll was apparently serious business – and not just because of its golden outer layer. Inside, the roll was packed with twelve types of premium seafood: Tuna from Oma, Aomori; Japanese puffer fish from Hyogo; Red sea bream from Nagasaki; Longtooth Grouper from Nagasaki; Oval squid from Nagasaki; Kuruma prawn from Ehime; Steamed abalone from Miyazaki; Boiled conger eel from Miyazaki; Boiled horsehair crab from Hokkaido; Salted herring roe from Hokkaido; Salmon roe pickled in soy sauce from Hokkaido; and Raw sea urchin from Hokkaido. Honestly, I have no idea just how impressive that list is, but I don’t see any cream cheese on the bill, so I’m guessing it’s better than your typical Philadelphia Roll. According to RocketNews24, “ehomaki” translates to “lucky direction sushi roll” and for maximum good luck, should be eaten while being pointed in the proper lucky direction. 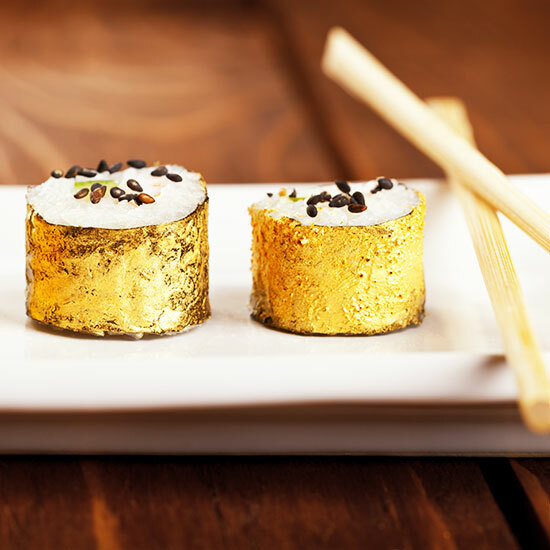 Though if you’re chowing down on a $97 gold leaf-wrapped sushi roll, my guess is that your luck is already pretty solid.